In 2009 more than 92 million people living in U.S. gave themselves a grade of C, D, or F on their knowledge of personal finance, suggesting there is considerable room for improvement, according to the National Foundation for Credit Counseling, Inc. Just over 30% of adults reported that they have no savings. Other studies have found that 57% of households in the U.S. don’t even have a budget. If these adults aren’t financially literate or have the time to learn the complexities of financial management. How can we expect children to be prepared for a solid financial future? As parents, we know it’s important to learn these fundamentals. One study by American Express found that 91% of parents surveyed say they are committed to instilling lessons of financial responsibility upon their children in 2010, with 62% giving their children a weekly allowance. Lilly Endowment has awarded a six-year, $3 million grant to Indiana State University to help fund continued operation of the university's distinctive Networks Financial Institute (NFI). The institute, housed in the Scott College of Business, has drawn praise for transforming public discourse of financial services regulations and producing a new generation of skilled industry leaders. "NFI has gained a national reputation for independent, nonpartisan research and award-winning, innovative student programs," said Brien Smith, dean of the Scott College. "This gift allows the college to solidify its position as an unquestioned leader in this area. We are grateful for Lilly Endowment's generous support. Networks Scholarships are for students in any business major who intend to pursue a career in the in financial services industry. Students participate in the Networks Professional Development Program. For more information about the financial services industry and career options, as well as the professional development program. On the surface, a grandparent jumping in to teach a young adult grandchild about setting the best savings goals may seem a little off-base. After all, isn't that what the kids' parents should have done? Maybe so. But kids can always use some reinforcement and often miss the message altogether, either because money can be such a touchy subject in some families, or because the importance of getting into the best savings habits early just never came up. Seriously: Some parents are more comfortable talking to kids about the birds and the bees than IRAs and CDs. And in fact, to say young people are ill prepared to handle their finances is a bit of an understatement. "It's abysmal how few financial capabilities younger people have," said Priscilla Stanton Wolfe, Ph.D., director of education at Networks Financial Institute at Indiana State University. Jessica Weesner knew the planned itinerary of her group trip to San Francisco. Still, she was surprised and humbled by a visit to a longtime city landmark: St. Anthony's Dining Room. 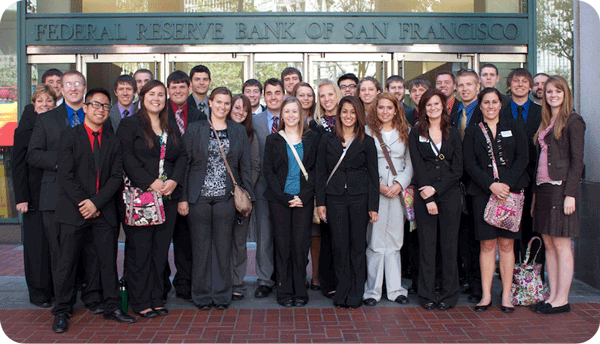 Weesner was one of 29 Indiana State University business students who, along with two staff members, visited San Francisco as part of a trip sponsored by Networks Financial Institute's (NFI) Networks Professional Development Program. They planned industry stops for students to learn more about financial services and other businesses, including the Federal Reserve. For several students, including Weesner, one of the most significant moments came when the group volunteered for St. Anthony Foundation, which operates a dining facility and provides other social services in the city's Tenderloin district. Eight incoming Indiana State University students have received the prestigious Networks Scholarship. Networks Scholars in the class of 2016 will receive full in-state tuition for four years, a $3,000 professional development account and a laptop computer. Scholars also will participate in the Networks Professional Development Program. The program, offered by Networks Financial Institute (NFI) in ISU's Scott College of Business, provides selected students an award-winning, four-year curriculum designed to cultivate leadership, management, teamwork and career skills. Students also receive access to corporate mentors, internships and travel opportunities. Dr. Troxel, an experienced insurance educator, researcher and trade association executive, has led The Gongaware Center for Insurance and Financial Services and its related initiatives since 2006. In addition, he has, for two years, overseen the operations of ISU's Networks Financial Institute. During his time at ISU, he brought to the college and the university a rare blend of academic and industry experience that has become the hallmark of ISU's renowned insurance and risk management program. He will retire from ISU on June 30, but will remain as a consultant for Scott College of Business programs. Faegre Baker Daniels LLP and FaegreBD Consulting were pleased to partner again with Networks Financial Institute in presenting the 8th Annual Insurance Reform Summit in Washington, D.C., on March 21, 2012. This year's Summit focused on the continuing discussion about modernizing insurance regulation in the wake of the enactment of the Dodd-Frank Act in 2010, with particular attention to the Federal Insurance Office and its widely anticipated first report to Congress. FIO Director Michael McRaith had been expected to speak at the Summit, but due to the delay in the release of the FIO Report, he was unable to speak. Participants in this year's NFI Summit included U.S. Rep. Ed Royce; Susan Voss, National Association of Insurance Commissioners Immediate Past President and Iowa Insurance Commissioner; Roy Woodall, the voting independent insurance member on the Financial Stability Oversight Council; Professor Robert Klein of Georgia State University; Professor Jean Kwon of St. John's University; Richard de Haan and Thomas Ward of Ernst & Young; and an industry panel consisting of Brady Kelley, Executive Director of NAPSLO; Leigh Ann Pusey, President of the AIA; and Roger Schmelzer, President of the National Conference of Insurance Guaranty Funds. The benefits of the surplus-lines-modernization law enacted in 2010 are already being felt through greater efficiency in the marketplace and likely lower premiums for customers, according to an official of the National Association of Professional Surplus Lines Offices. Brady Kelley, NAPSLO executive director, made those observations in comments on the surplus-lines industry before the Networks Financial Institute’s Insurance Reform Summit, held Wednesday in Washington. Iowa Insurance Commissioner Susan Voss, the immediate past president of the NAIC, will kick off a regulatory reform summit Wednesday in Washington, at which Rep. Ed Royce, R-Calif., will follow with luncheon remarks anticipated to address the status of the NAIC as an organization. To date, the NAIC has not yet responded to a Feb. 28 letter to the NAIC from Rep. Royce, a senior member of the House Financial Services Committee who asked the NAIC to precisely define what it is and how it is governed. Royce has been a longtime champion of an optional federal charter for insurers. It is expected to soon. The open meeting will convene March 30th at 1 pm, in the Cash Room, at Treasury, about five months after the advisors were named. The director of the recently created Federal Insurance Office will deliver the keynote address at the upcoming Insurance Reform Summit in Washington, D.C.
Indiana State University’s Networks Financial Institute is organizing the summit. FIO director Michael McRaith will speak at the eighth annual Insurance Reform Summit: An Era of Enhanced Federal Scrutiny, which will take place in the Rotunda Room of the Ronald Reagan Building on March 21. Speakers will discuss issues, legislation and research affecting the insurance industry, including elements of the Dodd-Frank Wall Street Reform and Consumer Protection Act which created the Federal Insurance Office. The director of the recently created Federal Insurance Office (FIO) will deliver the keynote address at the upcoming Insurance Reform Summit in Washington, D.C.